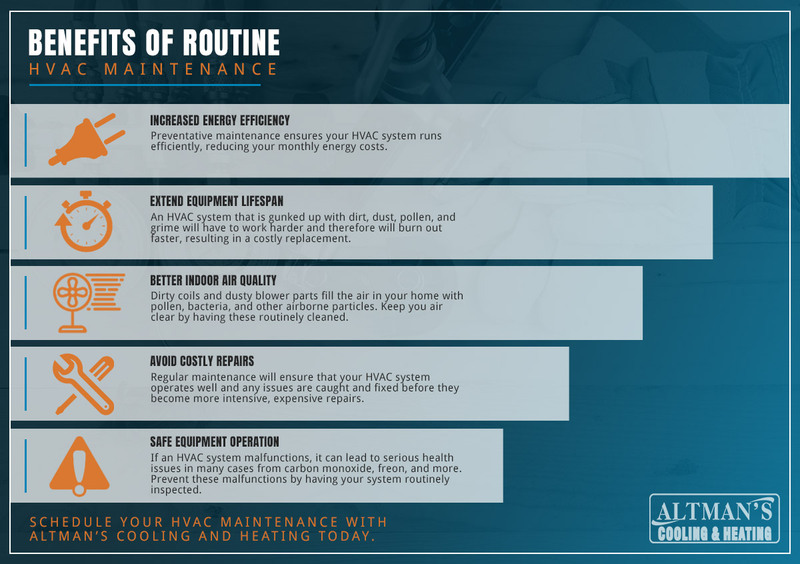 When your air conditioner unit breaks down, Altman’s Cooling & Heating offers peace of mind with routine maintenance in Titusville, Cocoa, and the surrounding Brevard County, Florida communities. One of the air conditioning services we provide is preventative maintenance. Preventative maintenance ensures a cool environment, lowered energy costs, fewer repairs, and an extension of the life cycle of your unit. Call to set up a regular maintenance schedule, and we’ll make sure that your rooms are temperate and inviting all year round. Thermostat: The correct thermostat settings ensure that the cooling system not only keeps you comfortable when you are home, but also saves energy while you are away. Electrical Connections and Voltage: Tightening all electrical connections and measuring motor voltage currents ensures that the system is safe to operate and extends the life of major components. Lubrication: All moving parts must have proper lubrication. Parts without proper lubrication cause friction in motors and increase the amount of electricity you use. pump (when in cooling mode) should be regularly inspected. A clogged drain will cause water damage and affect indoor humidity levels. System Controls: Checking control functions ensures that the system is safe to use and that the operation cycles properly from turn-on to shut-off. Air Ducts, Evaporator and Condenser Coils: Clean air ducts and air conditioning coils enhance the system’s ability to cool your rooms. When ducts and coils are dirty or clogged, the system will run longer. This will increase energy costs and reduce equipment life. Refrigerant Levels: The right amount of refrigerant in your central air conditioner will make your system more efficient. This will decrease energy costs and increase equipment life. Blower Components: Cleaned and correctly adjusted, the blower components provide proper system airflow for greater comfort. Airflow problems can reduce your system’s efficiency by as much as 15 percent. When your air conditioner unit breaks down, Altman’s Cooling & Heating offers peace of mind with routine maintenance in Titusville, Cocoa, and the surrounding Brevard County, Florida communities. One of the air conditioning services we provide is preventative maintenance. Preventative maintenance ensures a cool environment, lowered energy costs, fewer repairs, and an extension of the life cycle of your unit. Call to set up a regular maintenance schedule, and we’ll make sure that your rooms are temperate and inviting all year round. How Often Do I Need Air Conditioning Maintenance? Drainage: The condensate drain in your central air conditioner, furnace and/or heat pump (when in cooling mode) should be regularly inspected. A clogged drain will cause water damage and affect indoor humidity levels. Air Ducts, Evaporator and Condenser Coils: Clean air ducts and air conditioning coils enhance the system’s ability to cool your rooms. When ducts and coils are dirty or plugged, the system will run longer. This will increase energy costs and reduce equipment life. For over 30 years, Altman’s Cooling & Heating has kept residents of Titusville, Cocoa, and the surrounding Brevard County, Florida communities in comfort. We are proud to offer the affordable $29 service call*, with fully equipped vans to solve common heating and cooling problems on the first visit. We maintain the highest level of customer satisfaction. Call and let our expert technicians deliver a prompt, professional, and friendly solution for all your air conditioning service needs.